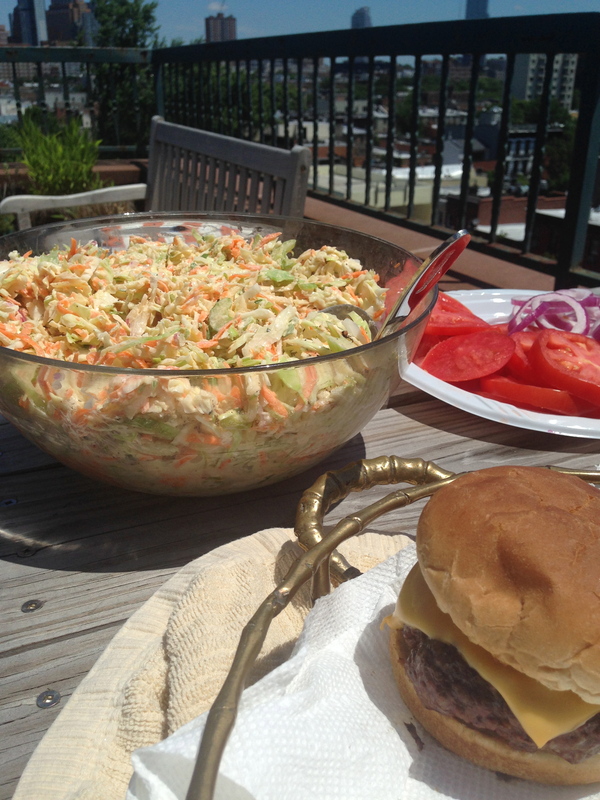 I made this coleslaw for Father’s Day and have looked forward to having it a snack every day since. It’s a perfect food to bring to a 4th of July BBQ or picnic because it can be prepared ahead of time. The magical thing about this coleslaw is that even though we keep eating it, the bowl is still practically full. I’m not really sure what causes this phenomenon. It’s like the everlasting gobstopper of salads. Anyway, it took about 15 minutes to whip it up in the food processor, and I am grateful for that as well. If you don’t have a food processor handy, you can do all the slicing by hand…but it will be much more time-consuming. This recipe also came from Williams-Sonoma’s Salad of the Day book. Cut the cabbage through the stem end into wedges, and cut out the core. Using a food processor fitted with the thin slicing attachment, slice the cabbage into thin slivers. Transfer to a (very!) large bowl. Slice the celery crosswise in the same way and add it to the cabbage. Replace the slicing attachment with the shredding attachment. Halve and core the apple but do not peel. Cut the apple and onion into wedges. Shred the apple, onion, and carrots, and add to the cabbage and celery. Sprinkle the vegetables with the vinegar and toss to coat evenly. Add the parsley and mayo and mix well. Season with salt and pepper to taste. Cover and refrigerate until chilled, at least two hours. Taste and adjust the seasoning with more vinegar, salt, and pepper before serving. Serve chilled. Thanks to Food and Wine for this refreshing chilled soup recipe. Here’s the link to the original. I pretty much followed it exactly, except I substituted 1 tablespoon red wine vinegar for the sherry vinegar, as there was no sherry vinegar at the store. Also, I had a hard time straining out the solids, so I didn’t do much more than get a few colanders dirty before giving up on straining altogether. This is not the kind of soup to make into a meal. Instead, it would be perfect at the very start of dinner or between courses as a sort of palate cleanser (thanks to my husband for that idea). 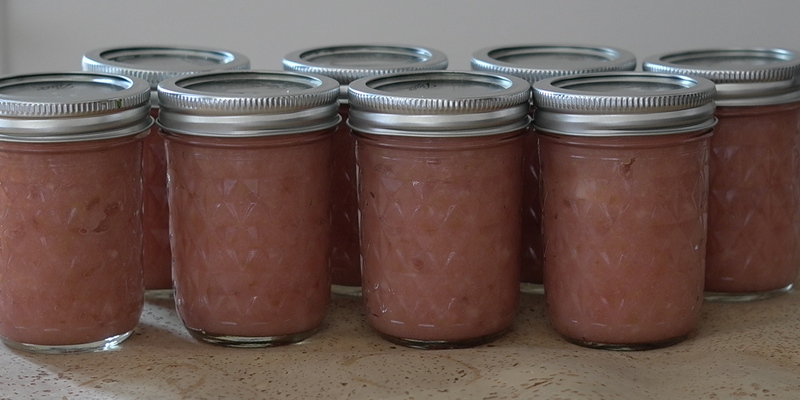 The recipe says it makes 6 servings, but I think this would make more like 8-10 smaller cups. In fact, this would be the perfect thing to use the 12 (!) espresso cups that I registered for 6 years ago, since I’m not usually making 12 cups of espresso at a time. Preheat the oven to 350°. In a small bowl, soak the bread in the grape juice for 5 minutes, pressing to soften. Spread the almonds in a pie plate and toast in the oven for 6 minutes, until lightly golden; let cool. Transfer 1 cup of the almonds to a blender. Add the bread, cucumber, apple, grapes, garlic, vinegar and 1/4 cup of olive oil. Puree until smooth. Strain the soup through into a bowl, pressing on the solids. (or make a mess with colanders in your kitchen). Whisk in the buttermilk and season with salt and pepper. Refrigerate until chilled, at least 30 minutes. 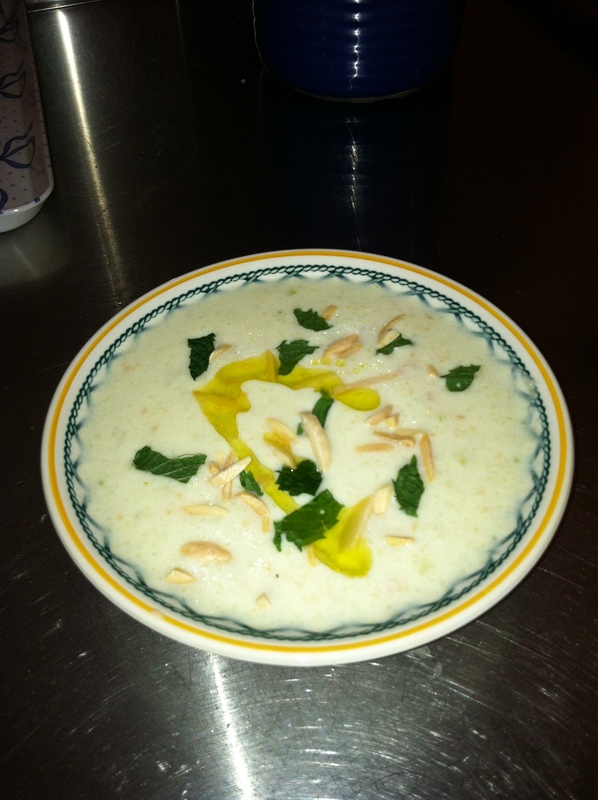 Pour the gazpacho into cups and garnish with the mint and remaining 1/4 cup of almonds. Drizzle with olive oil and serve.